Enjoy your brief spring and the beautiful colors it brings! 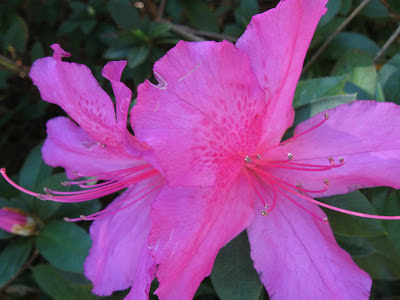 I love azaleas, they remind me of years gone by. Ours are trying to bloom, too, but, for some reason, some don't seem to have many blossoms this year. It may have something to do with their age. Some of them belonged to Ed's parents, and were given to us when they no longer wanted them next to their house. Those bushes are probably 50 years old, or more! I especially like azaleas, but have had no success trying to grow some labeled shade azalea in a shaded area under an overhang near my front door. Very disappointing to me. Nice to read you again. Spring is growing shorter every year it seems. Already 70 degrees here and cherry blossoms are coming out. Rabbits too. My dog spotted one this AM on our walk.